Search engine optimization encompasses a number of things. Some of them are not directly related to your website. There are certain offsite factors which need to be taken into consideration as well. Optimizing the website to get a good rank in Google is only the first step in a good SEO strategy. There are a number of offsite factors that will be considered by Google as well when ranking the website. If you manage to implement these factors in the proper manner, the chances of you getting a higher rank increase drastically. 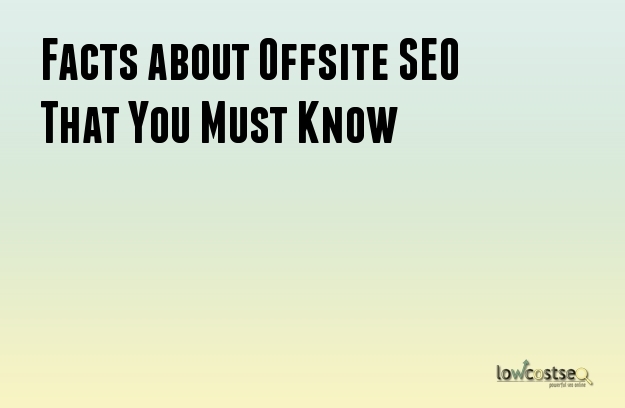 Before you start the implementation of the offsite factors, it becomes important to understand the processes required in offsite SEO. Earning backlinks of a high quality. Creation of good and original content. Increasing the visibility of the website in the search engine results pages. Improving the ranking of the website. Increasing the presence on social networks. Building up the online reputation. There are quite a few things that you will have to consider when going for Off Page SEO. The quality of backlinks depends on how relevant the linked page is to your content. The trust people place on the linked website as well as its authority will affect the quality of the backlink. By placing quality backlinks it becomes easier to get better rankings in search engines. A lot of importance is placed on the quality of the content by Google. If you are unable to provide good content, visitors to your website will not be impressed and leave. Keep generating content that is fresh and of a good quality for your website. The content should be engaging and your visitors should find it easy to read it. Additionally, ensure that the content provides value to the customers. With good content it is possible to get a number of backlinks. After all, people prefer sharing content that they enjoy and give them some value. You should remember about Author Rank while publishing the content. It is quite important as a ranking factor. When it comes to ranking your website, Google tends to place quite a bit of importance on the link profile of the website. In fact, most of the penalties levied by Google are due to the link profile. There are various factors that determine how good your link profile is. They are mentioned below. You should always try to improve upon the Off-Page SEO of your website to gain better results. You should remember that backlinks are not the only factor in a link profile. There are other considerations. You need a lot of links that are derived from high value websites. They should possess a higher domain authority. Using branded anchor text can be useful as long as they are relevant to the content. Avoid backlinks that are filled with spam or from poor websites. The quantity of quality backlinks must be higher.